Hi, I am interested in your 1978 Cadillac Eldorado (stock #5013-CHA) listed on Autotrader for $27,995. I'd like to get more information about this vehicle and confirm its availability. 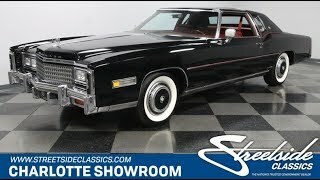 This 1978 Cadillac Eldorado Biarritz is a terrific mix of classic features, nicely restored pieces, and well-integrated upgrades. So look over this whole coupe, because its exactly what you want in classic cruising luxury. The design lines of this generation Eldorado are ones of a legend. Its a true statement of personal luxury with the extra long hood that begins a crease line that runs uninterrupted through the doors and flows into the sporty rear kick-up. The Sable Black has been given a quality respray to keep this coupe looking timelessly elegant. It even has a half-vinyl roof to give it a terrific double-black presentation. But its more than just that paint that really gives you the classic Caddy feeling. Bright chrome bumpers, a complete and intricate grille, color-matched turbine-style wheel covers, and classic whitewalls are all part of a correct and stylish package. Plus, we know you love the little touches, like the upgraded HID headlights and how the red accenting is a preview of the interior. It looks like there has been a solid investment inside to keep the factory-correct dark red leather interior looking its best and feeling quite supple. Theres plenty of space for family and friends to spread out, but with an individual armrest and power front seats, driver really gets to dial-in an individual level of comfort. This has the kind of luxury that made these Cadillacs so special when new, and it keeps them exceptionally desirable today. So you get power windows, power locks, cruise control, tilt steering wheel, and auto-dim headlights. There are even the cool period-correct pieces on display like the Cadillac-branded CB radio. But when they invested in the interior, they also gave it a very handy upgrade. Theres now a custom-made enclosure under the dash that houses a Pioneer AM/FM/CD/XM head unit that controls modern features such as Bluetooth and the backup camera. Under the hood is a year-correct 425 cubic-inch V8, and the honest presentation of the whole engine bay makes us believe the motor is original to the car. Topped with a four-barrel carburetor, these were true torque kings of the 70s. That gave them the ability to get up from the stoplight with gusto and keep the easy cruising nature you know in a Cadillac. This driving attitude is heightened by a smooth-shifting three-speed automatic transmission, and a ride that can only come from a classic Caddy. Add in power steering and disc brakes at all four corners, and this is a classic thats capable of taking on the modern world. Great colors, classic style, and the best upgrades dont let this special Caddy slip away, call today!